On May 25, 2008, the Phoenix lander arrived at Mars and raced to a safe touchdown on the northern plains. At the same time, NASA's Mars Odyssey orbiter turned its radio antenna to listen for signals from the spacecraft and relayed them to mission controllers on Earth. As an added benefit of the radio monitoring, an instrument aboard Mars Odyssey, the Thermal Emission Imaging System (or THEMIS), got a chance to take an image profiling the Martian atmosphere as seen above the edge (or limb) of the planet. In normal operation, THEMIS points straight down at the ground passing below the orbiter. Scientists term this viewing geometry as "nadir-looking," referring to the point opposite the zenith, which is straight overhead. THEMIS is basically a camera, and its fundamental mission is to image Mars at 10 infrared and five visual "colors." The visual images map the landforms, while the infrared images detect surface temperatures and identify mineral compositions. To communicate with the Phoenix lander, the location of Odyssey's antenna required mission control to roll and tilt the entire spacecraft so the dish pointed at the ground. And THEMIS (which is bolted to the side of Odyssey) rolled and tilted with it, turning its gaze off toward the limb of Mars, 90 degrees from its usual perspective. During the roll, THEMIS made the image at right, which sweeps from the cratered surface of Daedalia Planum northward to the visible edge of Mars. It also includes the atmosphere (seen edge on) and the blackness of space. "Oblique views like these - which we call 'off-nadir images' - suggest an additional role for THEMIS," says Philip Christensen of Arizona State University's School of Earth and Space Exploration. A Regents' Professor of Geological Sciences, Christensen is the director of the Mars Space Flight Facility as well as the designer and principal investigator for THEMIS. "We would like to take such oblique views more often in the future," he says, noting they can help out in the study of the Martian atmosphere. Such studies are crucial for understanding Mars' weather and climate. Christopher Edwards, a graduate student at the Mars Space Flight Facility, explains, "We can use THEMIS to map relative temperature differences in the atmosphere, extending from the surface to space. Tracked over months and years, these measurements should give us data on the different sizes of particles caught in the air." Sideways viewing offers additional benefits as well, including letting the THEMIS team fill gaps in the visual coverage of the surface. The global image map of Mars at visual wavelengths still has many blacked-out sections sprinkled across it, where coverage is incomplete. Also, clouds and haze have obscured the ground at times when the spacecraft is flying over. But with THEMIS operating in nadir-only mode, months or even years may pass before it can re-observe an area on the ground under clear conditions. "Looking off-nadir - even 20 degrees or less - would make it much easier to fill these gaps," says Christensen. NASA is considering new mission rules for Mars Odyssey that would allow THEMIS to point away from the nadir as part of routine operations. If enacted, the rules would go into effect after Mars Odyssey finishes its role as radio relay for Phoenix. In addition, explains Christensen, NASA is also considering another possible modification: "After the Phoenix mission wraps up this fall, NASA may change the orbit of Mars Odyssey." This would alter the spacecraft's orbit to pass overhead at 3 p.m. instead of the current 5:30 p.m. time. The result would give significant benefits for THEMIS and the scientists who use its data. "Changing the orbit to an earlier time of day magnifies the day-night temperature contrast in the surface rocks," says Christensen. Strong temperature differences make it possible for scientists to detect different kinds of rocks on the surface using THEMIS. Says Christensen, "This would give us a lot better data to carry out the mineral identification part of THEMIS' mission." As Mars Odyssey turned to listen for Phoenix, THEMIS swept northward across the Martian landscape, profiling a section of Daedalia Planum. The semi-transparent band above the horizon is the atmosphere, warmed slightly by the dust it holds. Above that is the black of space. 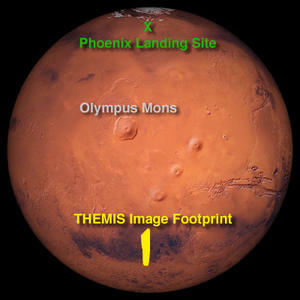 The yellow streak shows the footprint of the THEMIS image above. At the time the image was taken, THEMIS was aiming northward toward the area where Phoenix landed.